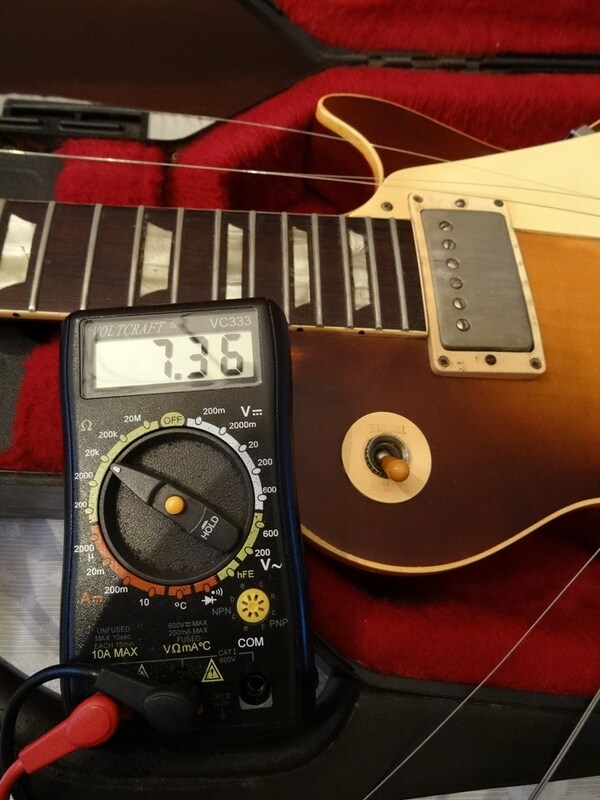 a bought this seller an AVR Jazzmaster a few years ago, good transaction ! I'm pretty sure that's the BZN burst. 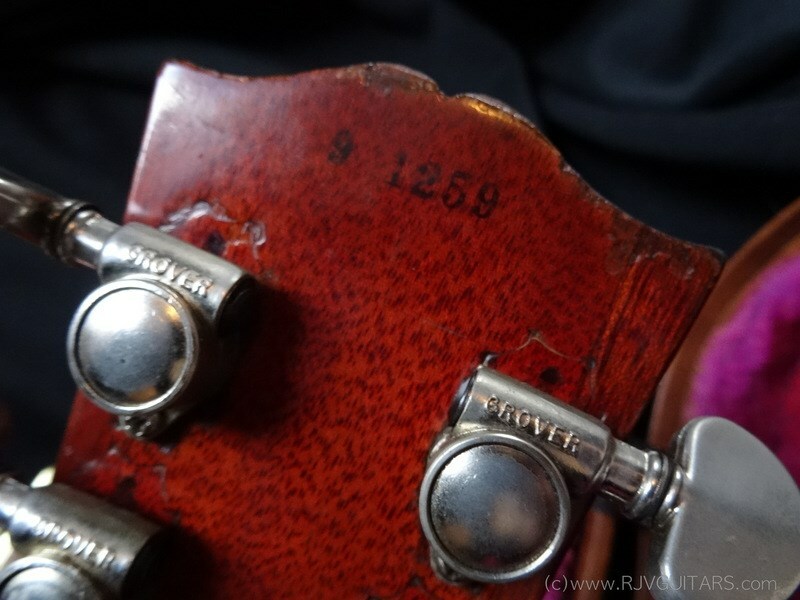 ...I've known of that burst serial number existing since the early 70s ...at one time I had a pic of it being leaned against a house outside along with a dozen or more other vintage guitars ...I think that pic may be long gone ..however, I also had a rear close pic of the serial number and even at that point it had a tuner change ....I'll do some digging later and see if I can find that one..
That's a great looking burst. Thanks for sharing. Nee, meneer. 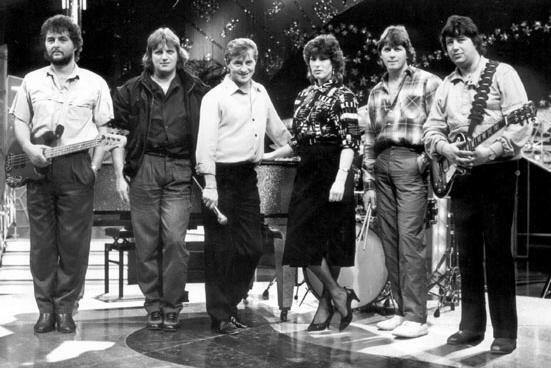 De gitaar zonder naam. Here is the holy grail and i am proud to offer it for sale, a newly discovered original Burst. Found it on the attic of a musician near Amsterdam last January. He owns the guitar since 1981 and now is ready to part with it and asked me to offer it to the world. It has the very nice serial# 9 1259, the only Burst i know of who has 59 in the serial#, how cool is that. It's a plaintop with still a nice Burst on it, only light fading into a brownish Burst. The original PAF's have an output of 7.3 ohms and sounds magical, not so high output and therefore a sweet, warm, mellow sound which also rocks when you want to, i love it, this is a true tonewonder. We compared it to other vintage beauties, but to me the legend is true, these 59's really have something special. 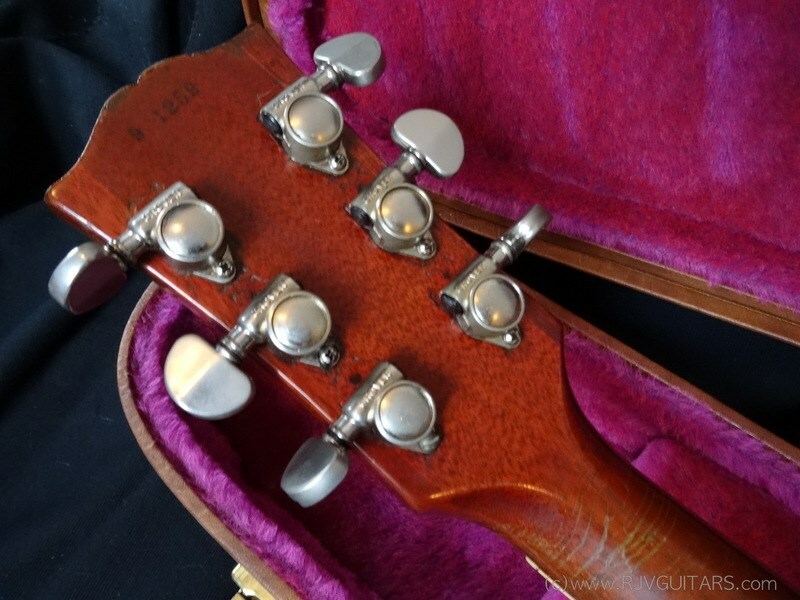 The guitar was played ofcourse, so it has changed tuners into Grovers, 2 later date pots, later date pick-up rings and some other changed plastic parts, frets are also changed. Between the volume and toneknobs there are some hairline cracks in the wood, a light hairline crack is also present in the back cavity. The hardcase is a later date. So it has some wear and changed parts, but it's a newly discovered Burst which isn't in any registry yet and looks and sounds wonderfull. Other than the fact that this is in Europe, it's probably the easiest approachable '59 burst that doesn't have a broken neck. Cost a pretty penny to go find all the correct parts, if someone wanted to. Very cool looking guitar, love the colour! There's photos on the dealer's website. Last edited by abalonevintage; 07-03-18 at 04:52 AM. Where do you realistically price this in today's market? It's a plaintop, with some whoop to it, that needs some fairly expensive plastic to complete it. Thoughts? Too many unknowns to even try. That "faded" spot is certainly unusual. It looks to be more of a repeated "rub" than it is a fade. The cracks are unusual as well. I can imagine they darkened over time as sweat accumulated in them. Fred Dons....how far do you go back remembering this burst? It's not so much that the cracks are unusual, it's that they "look" unusual. That top looks refinished to me. It does look questionable in these photos. My bets are on a top refin, too. 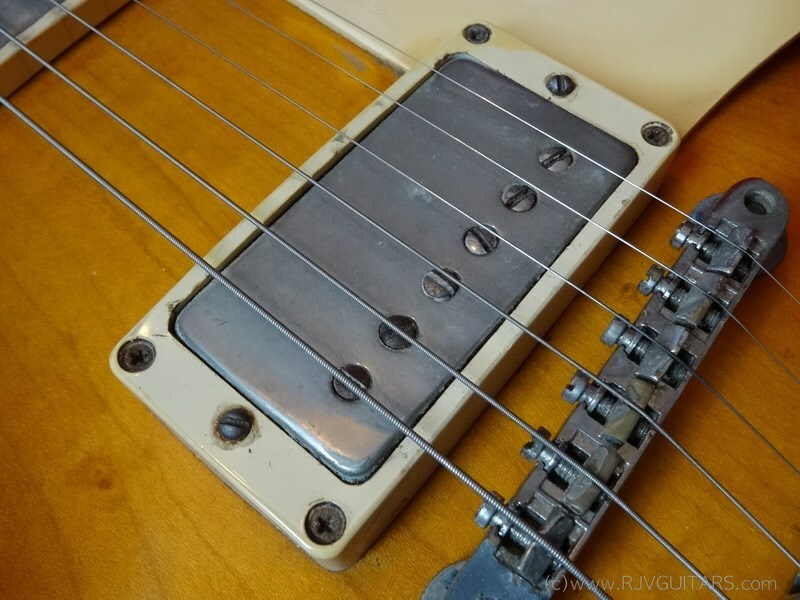 There is also little to no sign for less fading under the neck pickup ring. Also, looks like some new solder on the neck volume pot. CD, it doesn't look like a rub to me. The only reason that I described it as faded was due to the lack of pigment in that spot. If that area had been rubbed to the degree that it had worn through the finish then I would expect it to be dingy/dirty, and it doesn't appear to be that way. Also handling/rubbing sufficient to remove that much finish would certainly wear the wood as well, and I'm not seeing that in the photo. If the top was sanded aggressively to refinish, that could make it more likely to crack. The dark part of the burst looks opaque. I'm asking this to try to make someone laugh. 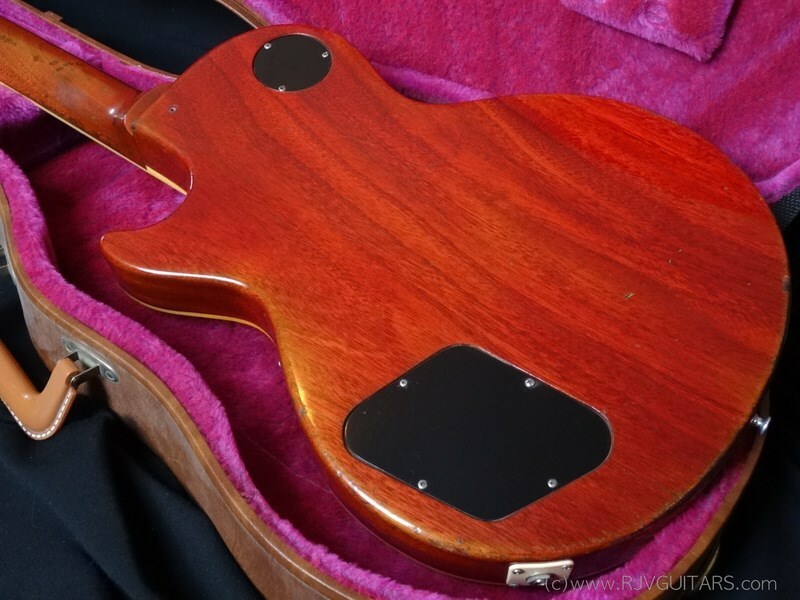 Before I comment on the guitar, and in view of the 'Real or Fake' thread in the Sunburst Pub, do the forum owners feel there is a a legitimate reason for analysing this guitar ? I don't want to get in trouble seeing as I'm on my final ban warning? Its more authentic than some that have been authenticated. anyway it is not an "attic" find as the owner plays this one every weekend in coverband, and 10 years ago he had already some idea on the value of the guitar, when the guitar needed to be refretted my friend who did the fret work could not find proper insurance which meant the guitar had to be brought to the shop every morning and returned at the end of the day till the job was done. He did not not care about babying his guitars btw, he had it refretted twice in 3 weeks as he did not like the smaller frets the first time. Thanks a lot for the background, Fred. At least in my mind, I don't think there's an issue of this guitar being a fake. Rather, there is some issue as to it's condition. 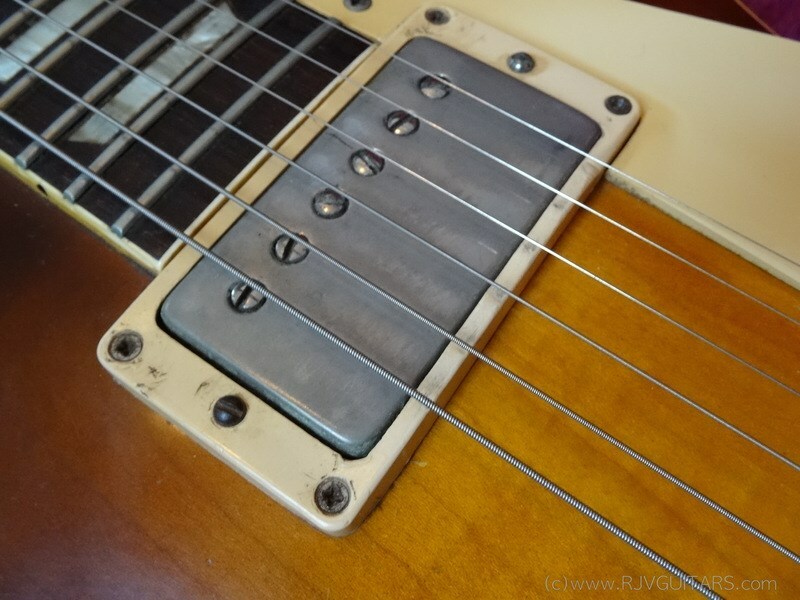 Since the shop owner is aggressively marketing it, both on his website and in the Les Paul Society on Facebook, I think we have, as a Forum, a legitimate reason to discuss the condition of the guitar. Thus, your double secret probation is intact for the time being, but watch yourself buster. If it's a refin, it's interesting that the color of the guitar appears the same in that video, that has to be at least 30 years old. Thoughts? Fred...do you have any insight? The seller doesn't think it's got a refinished top. He's sending me some more detailed pictures and if I like what I see and can negotiate a realistic selling price I'll pehaps go and look at it in person. I can do a trip there and back easily enough in less than a day. Maybe I'll see if Ray can come with me. Four eyes are better than two. Thanks Charlie. So guitars actively being 'marketed' as bursts are legitimate guitars for discussion? Just want to be clear not to break the conditions of my probation. I'm thinking that if it is a top refin, maybe it's possible it was done at Gibson in the early 70's. Those rings appear to be M8 pickup rings from the 70's also.